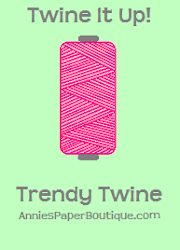 My Wise Designs: Last post @ 24!! This is my last post at 24!! In 28 minutes I'll be 25! whhhhaat?! I can't believe it myself. 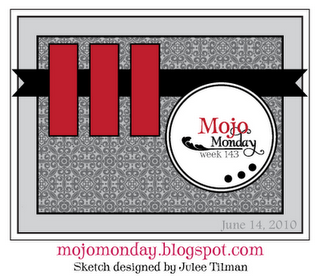 I played along with one of my most favoirte card blog challenges, Mojo Monday. 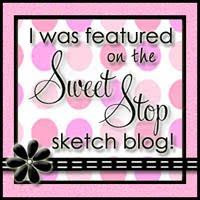 I just love their sketches! AND I made it on the challenge was released! I've never done that!! I've had this flower in mind for a while now. It's actually a bunch of hearts put together in a circle. I used the cricut and the George and Basic Shapes Cartridge to cut the hearts. The bottom layer are 1 1/4 inch and the top at 1 inch. I inked them and put them into a circle to make my flower. The I curled the ends of the flowers. If you try this, I would love to see it!! I handstitched the stem and leaf.